Description: Late in the afternoon during the summer, it was possible to get a shot of a train crossing the Chenango River from the north side of the bridge by turning off Front St onto McDonald Av. Here we see BUOI arriving at Binghamton from that angle. Description: Unknown location and photographer. 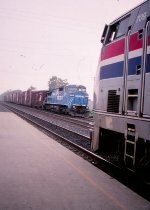 Description: TV10C rolls past the old BV tower west of Buffalo. This was the west end of the Buffalo Division.